Don's Notepad (Official): Pinoys: Will the real Philippine Maya bird please stand up? Pinoys: Will the real Philippine Maya bird please stand up? This is a classic case study of incorrect information being passed on from generation to generation. I hope this little piece of information can help calibrate the Philippine national identity just a little bit. The real maya, the Philippines' national bird before 1995. This was never a national bird of the Philippines! One of the most widely spread misinformation in the Philippines is the identity of our formal national bird. Before the Philippine Eagle was declared as the official national bird of the Philippines in 1995, the title previously belonged to the Philippine maya. When I was a child, I was told all of those tiny brown birds were all mayas. Everyone around me thought the same. My friends, family, and teachers, all of them thought the brown birds were mayas. Unfortunately what I was taught was incorrect. 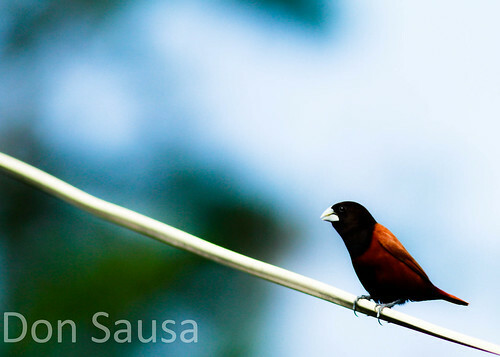 These brown animals, the most widely seen bird species in the country, is not actually endemic to the Philippines. It's found all over Europe and Asia and was introduced here. 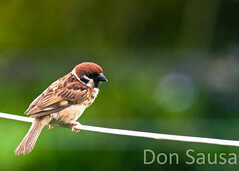 The official name of this bird is the Eurasian Tree Sparrow or Passer montanus. Thankfully this morning, in my backyard in Bacolod, Philippines, a real maya bird visited my garden. This was the first time I've ever captured a real maya bird on a DSLR. He was looking to build his nest and something in my garden attracted him. Soon there were two of them looking around for building material. 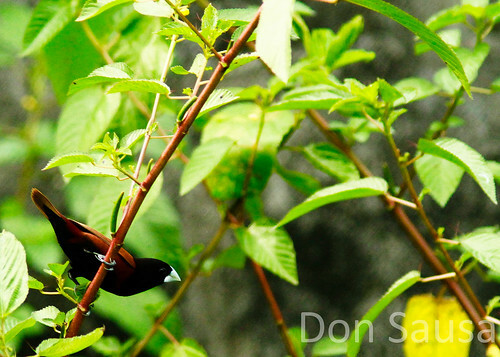 The Philippine maya is otherwise known as the Black-headed Munia also known as Chestnut Munia (Lonchura atricapilla). While it's family is found throughout Asia, the maya bird subspecies particularly belongs to the Philippines. It's called Lonchura atricapilla jagori. When they are young, the color of their feathers are brown but when they mature, they turn red. So there you have it, you have now been given truth. Spread it out and help educate the masses! Teach your friends, relatives, and children the correct information. If you are Pinoy, you should at least know your former national bird wasn't an introduced species by foreigners. I don't know about everyone but I've always known the brown bird was not the maya, and so did my friends, my playmates, my relatives and everyone I know in Camarines Sur. I never knew there was such a confusion. We have always called the brown bird COSTA and the reddish brown red maya. Type in maya bird on any search engine and you will unfortunately see the confusion. Thank you for this information. Sadly, I am also ignorant of this. @Angku - it's strange but we might actually have it in the opposite. Here in western visayas we call the "real maya" as maya costa. Thank you for the information, I may want to ask however if you have watched these birds for I am doing research on them, I value any type of information. :D please send me something through my blog or whatever means..comment here if its ok. Thank you for the info.. I was just finding the name of this common bird. Take care! I learned from school that the red bird on your DSLR pic is actually the Philippine Oriole tyler (Oriolus steerii) and the Eurasian Tree Sparrow is actually the one called "maya". Kainoa, please ask for a refund from your schooling. Maya is the local common name and it varies from island to island... but its scientific name is Lunchura malacca..
thanks for the info. the reddish brown maya are regular visitors in our lawn. This months, they have started to build their nest in the Chinese bamboo and bridal bouquet vine. they are fun to watch.